The Wargo Custom Shop has brought this ground-scraping 2015 Ford F-150 to SEMA, which features a brain-blasting stereo and a motorized driver's seat that drops to the ground for ease of entry. The whole truck's lowered 5" up front and 6" in rear. Suspension had to be custom fabricated because nobody makes parts for the new truck yet. The rest of the modifications are limited to leather interior details, an exhaust, a few hood scoops, rims, and a nifty paintjob. A pickup affords enough space for extra-mobility equipment, but the ride height makes wheelchair access a bit of a challenge. The lowered suspension helps, but the driver's seat still has to drop 16" after swinging out. It's controlled by a little wired remote. 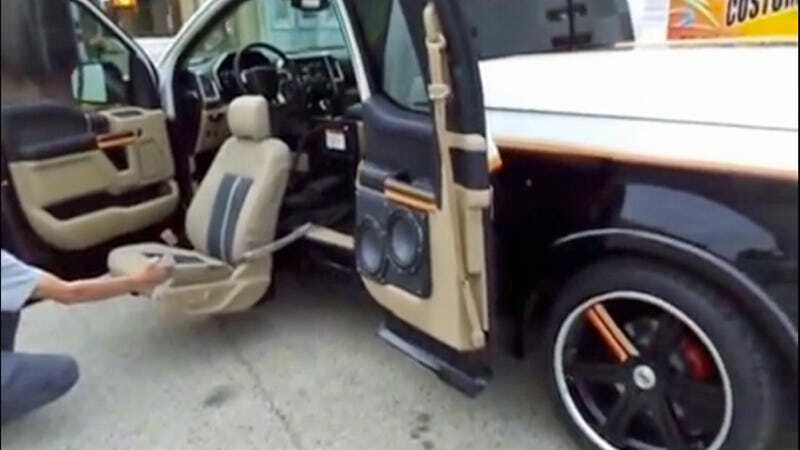 It looks like someone with strong arms would be able to transfer themselves from a wheelchair to the driver's seat, but getting the chair into the truck might still make for complications. Still cool to see what people are trying to make trucks more accessible.